If you’re applying primer or paint products to surfaces, you will need a spray gun, more specifically one of our HVLP spray guns. Our gravity and suction fed spray guns require no solenoid in the air chain, and will give professional results at a great price. The air spray guns we offer can be applied to our range of compressors, and can be adapted to the one you already have using the couplers/adaptors we also have available. Click on the products below to see our range of air compressor spray guns and accompanying HVLP spray gun cleaning kits. Here at SGS, we know that a good spray gun can make all the difference to your paint job – particularly when working on vehicles. That’s why we stock a range of different types, to make sure that you have the right one for you. We are confident you’ll find the right car spray gun for your garage that will leave your motors looking as good as new. Equally, as well as being used as car paint sprayers, you can also use these as general purpose air compressor paint sprayers for other tasks you might have. 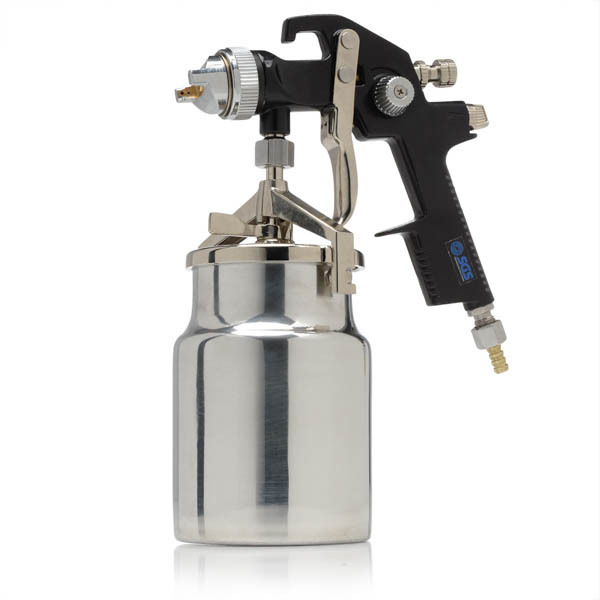 So whether you’re looking for gravity fed or suction fed spray guns, we’re sure to have the perfect air spray gun amongst our product listings. Not only are our HVLP spray guns available at low prices, we’re delighted to offer you high volume, low pressure spray guns to make sure that you get the most of your paint and as little as possible is wasted. All our air spray guns are of the best quality, and we know that you want to keep them working at the highest capacity, which is why we also have our HVLP sprayer cleaning kit on offer. So browse our variety of sizes and styles and order your new air spray guns with SGS today. If you need any advice on which is the best paint sprayer or the best car paint spray gun don’t hesitate to get in touch. We will be more than happy to help inform your purchases on our great range of air paint sprayers. Our air tools are great for a wide range of work tasks, such as: drilling, hammering, sanding, grinding, cutting, nailing, stapling, wrenching and more. To ensure you’re fully informed about these, whether you’re using a car paint sprayer or another air tool, we’ve put together a few how-to guides and some safety information to get you started. Learn how to spray paint a car here.